1. Cut the cheese, aubergines and red peppers into 2-3cm chunks, and place in a shallow dish. 2. Mix the oil, half of the lemon juice, oregano, garlic and some seasoning together. Add two-thirds to the prepared vegetables and cheese and mix well. Leave to marinate for 30 minutes before threading onto 8-16 wooden or metal skewers. 3. Light or preheat the barbecue, griddle or grill to medium. Cook the skewers for 10-15 minutes, turning occasionally, until coloured and tender. 4. Meanwhile, mix the remaining marinade with the tahini, remaining lemon juice, 2 tbsp cold water and seasoning to taste. 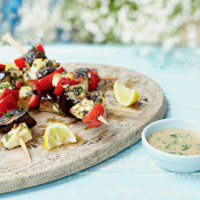 Serve the hot skewers with the dressing and lemon wedges to squeeze over.